Event moved to our rain date – Sunday, 28 April due to poor weather. Join Canadian Wildlife Service biologist Rich Russell for a nature hike on the Crazy Horse Trail on Sunday, 28 April at 9:00am. Pre-registration, payment of $20, and signing a waiver are required. Discover early-arrival migratory birds, early-emergent wildflowers, amphibians, and maybe turtles. Rich is a Carp Hills resident, wildlife biologist, and outdoors enthusiast. We’re lucky to get some of Rich’s time before he heads up north in May. Rich has offered to bring an acoustic recording unit to discuss the application of technology in bird monitoring programs, like for the upcoming Ontario Breeding Bird Atlas. He says that migration is already underway so we should see/hear kinglets, phoebes, pine warblers, thrushes, and sparrows. We may hear wood frogs and peepers. If it’s a sunny day perhaps a winter-weary turtle will be basking in one of the ponds where we’ve seen them in the past. For the enjoyment of participants we are limiting this event to 25 people. Ten people signed up at our AGM so act soon! The cost is $20 per person; children under 16 are free. Proceeds help cover the cost of our insurance so that we can offer these events. Please register by buying your ticket(s) on-line using Eventbrite: Spring Has Sprung in the Carp Hills. The trail will be wet, muddy, and slippery. Rubber boots are a requirement as we will likely be wading through large puddles. Download, print, and sign the waiver (PDF). Bring your copy to the event. We will have a few blank copies on-site if you forget to bring it. Meet at the trailhead on March Road at Huntmar Drive by 8:50am to sign-in before our 9:00 am start. Bring binoculars, a camera, and your curiosity! We will go out rain or shine. However, if it’s raining hard, we may postpone the event to Sunday, 28 April. Check our web site for confirmation. The spring melt down is revealing a large amount of dog poop on the Crazy Horse Trail and in the woods. We’re lucky to have this trail open for dog walkers. Dogs are banned in many sensitive natural areas owned by the City and the National Capital Commission. It’s not just your dog leaving its waste; it’s many dogs a day doing so. This volume of waste with alien microbes from non-native animals is introduced into an ecosystem that is not set up to handle it. Dogs can transmit diseases such as Canine Distemper Virus to wildlife. Dog waste fouls the water. It’s unsightly and smelly for trail users. Your dog can get sick from eating other dogs’ poop or from lapping up fouled water. Keep your dog under control by the trail at all times. Pick up and carry out your dog’s poop. Do not let your dog chase wildlife. We invite you to join us for a guided hike in the Carp Hills on Sunday, 21 October at 1:30pm. We will start on private property at Donald B. Munro Drive, where we will ascend the escarpment for one of the best views of the Carp River valley. We’ll then cross over onto city-owned land for a scenic view over a wetland near the Crazy Horse Trail, and return to where we started. Make sure you wear hiking boots or other sturdy shoes. We will be crossing 15m of wetland on a narrow, temporary boardwalk. Some sections of the hike are wet. We encourage everyone to bring their cameras and post their photos to our Facebook page. The best photo (as judged by the FCH executive) will be used as our Facebook banner. There is no need to pre-register. The event will run rain or shine (unless it’s pouring!). A donation of $10 is appreciated to help cover our insurance costs. Since we will be starting and ending on private land, participants must stay with the guides and group. You will be asked to sign a waiver, which you can download and bring to the event. We will have some paper copies on-site for those who forget to bring them. To get there: Park behind The Carp Cabin at 211 Donald B. Munro Drive. Walk across the road, through the gate, and up the gravel track until you reach the open grassy area where you will register and gather before the hike. People participate in this event at their own risk. Wear hiking boots and tuck your socks into your pants. The terrain is very rugged and the climb is steep. The trail may be wet and slippery. You may hike through poison ivy. Black-legged ticks are present and may carry the bacteria that causes Lyme disease. You can download and print the waiver (PDF) here. In celebration of National Forest Week, we are pleased to offer some” Tree Time” on Tuesday September 25th from 1000 am to 1230 pm. As part of this fundraiser, we will be guided by certified Forest Therapy guide Andrea Prazmowski (http://www.foresttherapyottawa.ca). Over the course of this gentle 2.5 hour exploration, Andrea will invite us to deepen our connection to the forest and nature. Refreshed and calmed by the forest, we will end with snacks and tea. Meet at the trailhead for the Crazy Horse Trail on March Road at Huntmar Drive. Come dressed with sturdy footwear and protection from possible mosquitoes and ticks. This is a rain or shine event. The forest never disappoints. If you have any questions, please contact Maureen Rae. You never know what you’ll find when you start looking! Seeking to know more about the history of “The Carp Hills” we found ourselves fascinated by our visit to an historic farm bordering the northern parts of the ridge . The farm buildings include logs harvested as long ago as 1829. This part of the township was surveyed by Reuben Sherwood in 1822. Sherwood ( 1775-1851)was the son of one of the first Loyalists to settle in Leeds County and was a Provincial Land Surveyor. The property has revealed ancient hide scrapers, and a whole collection of clay pipes , some bearing the mark of Robert Bannerman Clay Pipes from Montreal (1855-1907). The owner of this wonderful property shared her research about the ancient history of her farm dating back over 11,000 years to the time of the Champlain Sea. The Champlain Sea was a temporary inlet of the Atlantic Ocean created by retreating glaciers in the last ice age. The sea included lands where we now live . In this next map (see below) provided by our host we can see the “island “ of the Carp Ridge floating in the sea. The historic farm we visited had previously been on the shores of the Champlain Sea. Evidence of ancient Indigenous peoples activities is present on this land, including fire rings on what would have been the shoreline. We have respected the owners desire for anonymity but thank them for their generosity in sharing their research. Perhaps in future editions we can share more news from an archeological assessment of the property. Stay tuned. If you have history about the Carp Hills that you’d like to share, Contact Us. An Ottawa researcher is trying to figure out why the west end of our city is seeing a dramatic rise in the number of ticks carrying Lyme disease. Epidemiologist Dr. Manisha Kulkarni says her research shows that at least one in every three ticks is carrying the bacteria that can cause a chronic and debilitating illness. The research so far shows about 30 to 40 percent of those west end ticks are testing positive for Lyme disease but Dr. Kulkarni believes it could be higher than that. 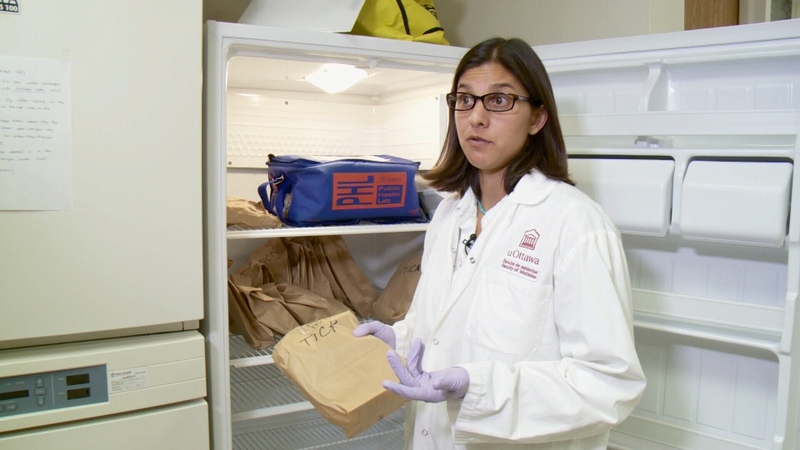 Brown bagging it has a whole new meaning at this University of Ottawa lab. “So these are the samples that have come in from Ottawa Public Health,” says Dr. Kulkarni, as she opens a fridge in her uOttawa lab. Dr. Manisha Kulkarni in her uOttawa lab. “This is a weeks’ worth, so we’re probably looking at about 15 ticks per week,” she explains. They are ticks sent to Ottawa Public Health from members of the public, taken off themselves or their children. They end up in Dr. Kulkarni’s lab for testing. This year she says, there are far more ticks submitted than last year and many more testing positive for Lyme disease, especially those from Kanata, Carp and Stittsville. Dr. Kulkarni’s research project, funded in part by the Public health Agency of Canada, is trying to figure out why recreational trails, provincial and municipal parks in the west end are seeing a dramatic rise in the number of ticks. The thinking is that it is connected to a growing problem south of us, a problem creeping up a wooded corridor in the Kingston area that has a long-established tick problem. That’s no surprise to Lesley Fleming. She has Lyme disease and a keen interest in where those Lyme-carrying ticks are. She dragged for ticks at the NCC recreational pathway behind the DND building off Moodie Drive a few weeks ago. Of the two ticks she found, both tested positive for Lyme disease. The path is popular with both DND employees and dog walkers. She also dragged for ticks at a popular bird-watching spot in Shirley’s Bay. One of the three ticks collected tested positive for Lyme. Now, alongside the no-smoking and poison ivy signs, she’s pushing for signage to warn of ticks. Ottawa Public Health says with the wet weather, it has yet to begin dragging for ticks but plans to start June 28th in Carp, Stittsville and Rockcliffe Park. Later this summer, it will do tick drags in all areas of the city including east and south ends. OPH says to date, 88 ticks from the Ottawa area have been submitted and 17 or 19.3% have tested positive for Lyme disease. Other than building his house in an environmentally sensitive manner, Greg’s number one priority is conserving the landscape. He plans no other structures or alterations to the property. He shares the Friends of the Carp Hills’ goal to protect the Carp Hills and sees himself as a steward of the land. Greg knows that in the past residents have enjoyed walking and skiing in Hidden Lake, but the property is private and not open to the public. Greg will be posting signs to ensure that people know where the boundaries are and they don’t inadvertently trespass. ATVs and hunting on the northern side of the property to shoot waterfowl are also not permitted. People can still experience Hidden Lake in the City-owned 10 acre park next to Greg’s property. Hidden Lake Park has a short trail that can be accessed from Charlie’s Lane or Hidden Lake Crescent and has a nice view of the lake. The one kilometre trail is clearly marked by crushed gravel and has two interpretive signs. When entering the park from Charlie’s Lane, turn left to follow the trail, otherwise you’ll enter private property. Greg farms 50 acres on Marchurst Road called March Meadow Farms, growing pesticide-free vegetables for roadside and market sales. Stop by and visit him at the farm. The address is 1490 Murphy’s Side Road. Like his March Meadow Farms Facebook page to follow what’s happening. Let’s give Greg a warm welcome to our friendly village of Carp.